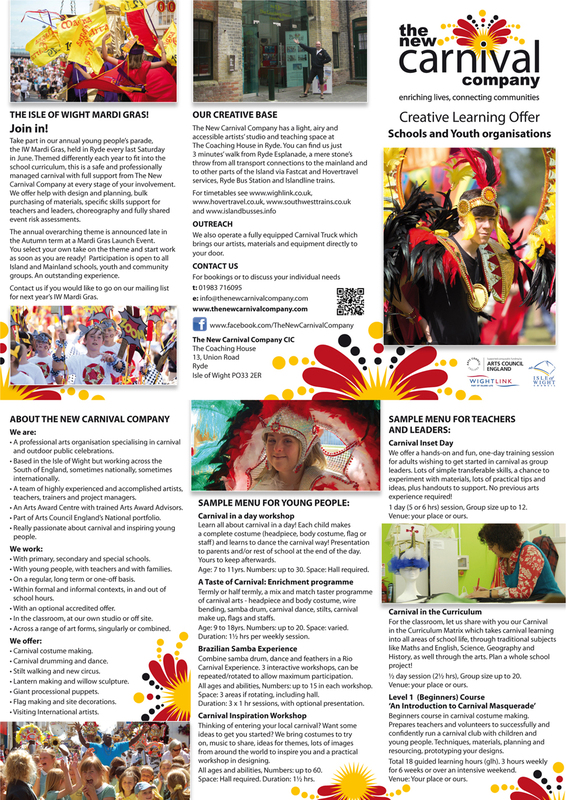 The New Carnival Company presents an exciting offer for schools and education partners across a range of subject areas. We work with young people, teachers and families, in the classroom, at our own studio or off-site. We encourage the integration of carnival and outdoor arts activities into mainstream areas of the curriculum, and schools can access our Carnival in the Curriculum Matrix here. We offer Inset training and CPD sessions to teachers, TAs and adult volunteers to demonstrate creative ways to deliver this. Our flagship Mardi Gras project demonstrates the breadth of learning and research topics that underpin our annual parade. We have developed a unique and bespoke adult learning course ‘Supporting Carnival Practice’ at Levels 1 (Beginners) and Level 2 (Improvers) to build up a practical skills base to support independent classroom delivery and for after school carnival clubs. In 2018, 25 adults from 14 schools and groups attained their Level 2 certificate, contributing significantly to higher quality presentations at our events. The courses are very practical, explorative, hands on and fun, also great for team-building. Contact us for detailed information, upcoming dates and for off-site delivery in mainland settings. We can also help schools and colleges access visiting and international artists through our extensive network of carnival artists including calypsonians, steel pannists, wirebenders, stiltwalkers, float and puppet builders, samba and African drummers and dancers. We a currently working with a range of Indian creative partners for Mardi Gras 2017 including the internationally acclaimed Kala Chetana Kathakali Company and T-HOP international.